Thank you for purchasing Facebook Advertising for Authors! I'm so happy to welcome you into our exclusive advertising enclave. You're going to learn a lot, and I'm very confident that you'll be able to deploy the lessons to give your writing career a massive boost. I’m very proud of the course and I can’t wait for you to get started. Some suggestions first, though. I would recommend that you watch the course in its entirety, take careful notes, and then start small when you are ready to begin experimenting with ads. Remember always to set realistic advertising budgets that you can afford. Your first tests will likely be unsuccessful - mine were - but you can run them with budgets of £5-$10 a day. Don’t go crazy! On this page you'll find useful information you may want to keep close to hand while you are using the course as well as details of all of the bonuses on offer to all students. The course can be found at learn.selfpublishingformula.com. If you misplace your log-in, you can reset your password on the log-in page. Just look for the ‘Forgot password?’ link. Any problems, email us at support@selfpublishingformula.com. On the ‘Class Curriculum’ page, you will notice a small arrow pointing to the left in the top left corner; click on this. You are now on the ‘courses’ page. 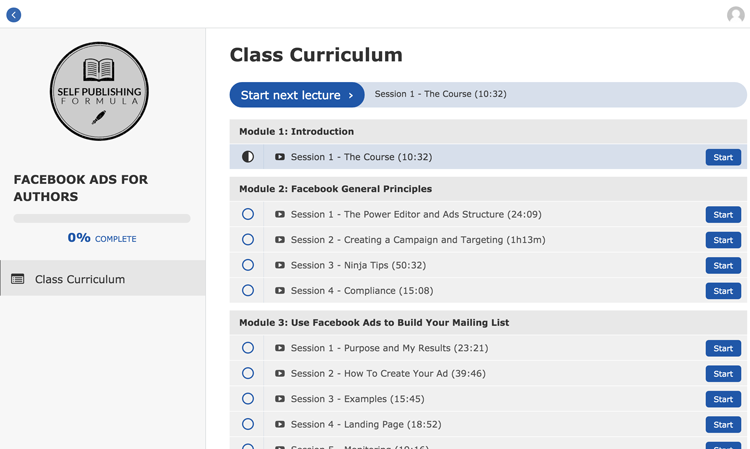 Click on ‘My Courses’ in the top right and you will see the Twitter Ads course alongside the Facebook Ads. You will be taken to the Twitter Ads course curriculum page. You can go back to the Facebook Ads in exactly the same way. These can be downloaded from individual session pages within the course. You will be able to download all the sessions to your own desktop or mobile device for offline use from 10 December 2015. If you are not already in the original secret Self Publishing Formula Facebook group, please drop us a line at support@selfpublishingformula.com and we’ll do the necessary. You are now eligible to join our second closed sub-group - MASTERY - specifically for students of this course. Again, please let us know at support@selfpublishingformula.com if you’d like in on that as well. It is proving an extremely useful resource. If you have any questions, I’d ask that you post into the Facebook groups first. If that doesn’t provide you with the answer that you are looking at, then email me and we’ll get it worked out. If you would like to begin the two week period later than today’s date, that’s fine. Just email support@selfpublishingformula.com and we’ll take a note. Please also bear in mind that I am out of the country between 8-15 November and I will not be able to respond during that week. It'd be very helpful if you could also avoid opting for your 2 week support period during the upcoming Christmas break (19th Dec - 4th Jan). Developed by SPF student Shawn Manaher and his team at Book Marketing Tools we are delighted to include this natty zip file. It includes a template that will allow you to very easily create a high converting landing page, based precisely on Mark's own proven design. In fact it is so closely based on Mark's that the first thing you will need to do is change his name to yours and replace the books image! The zip file includes a step-by-step guide that shows you how to integrate the template to your own LeadPages account. This does require a LeadPages standard account and whilst the template currently costs $7, this cost will be automatically refunded to you. If you would like sign up to LeadPages, you can do so here. We have negotiated a valuable discount with the wonderfully talented Stuart Bache, who designs my own book covers. Stuart is offering a package which includes ebook, Facebook Ad Images and a 3D packshot for just £280 (about $420), the original price is £350 (about $525). He’s also offering SPF students just the Facebook Ad images (working with your files / new concepts) for £30 (about $45), representing 40% of his usual price. When you’re ready visit Stuart’s page - Books Covered - and quote SPF102015 for your exclusive discount. This is an incredibly useful guide prepared by Larissa Reynolds (FictionInsidersClub.com), which she has subtitled ‘What to Say to Your Readers When You Don’t Know What to Say”! Keeping you and your books in your reader’s minds is crucial to your long term sales. This guide will give you more than 50 writing prompts to enable you to construct compelling emails that you can send when you’re not yet ready to say ‘buy my book’. 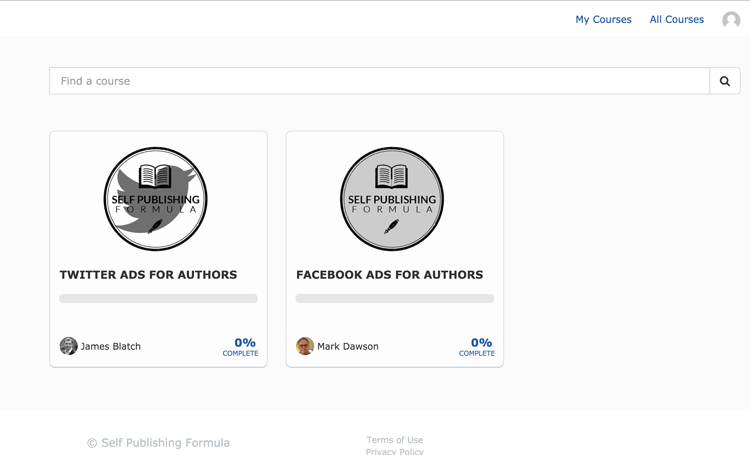 The Author's Email Handbook is ONLY available through this exclusive partnership between Self Publishing Formula and Fiction Insiders Club. As an extra bonus, we've also negotiated a free lifetime subscription for you to join the Fiction Insiders Club, a private email newsletter geared to the unique needs of fiction authors and publishers. Filled with actionable tips for authors, self-publishing strategies, real-world case studies, weekly commentary and more. Fiction Insiders Club subscriptions are usually $199, but you can join free as an SPF student when you download The Author's Email Handbook (link above). 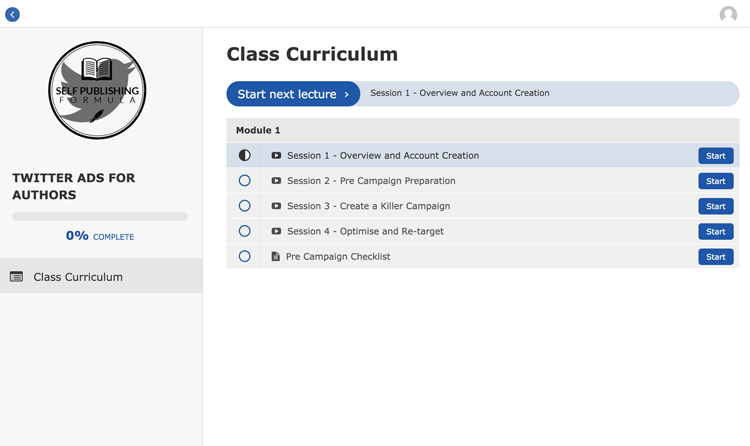 This has now been added to the course and comprises autoresponder emails - as downloadable pdfs - in Module 3, session 6 and an Advertising Analysis spreadsheet in Module 4, session 6. All useful stuff... but there’s more! I had a couple of requests for the autoresponder I send out to recruit people to my advance team. 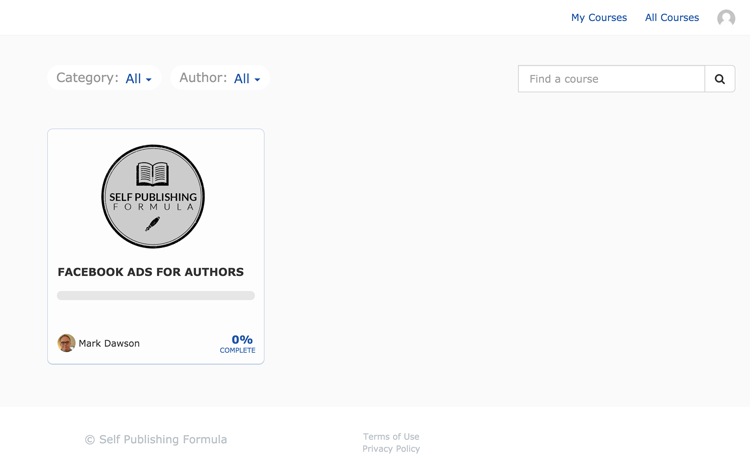 If I ever do another course (and if you hear me suggest it, please remind me how much work this one entailed), it’ll be on launching books, and the Launch Team is the critical component in the system that I developed. You can (and should) be building your own right now, especially if you are using FB ads to build your main list. So, you can find the precise Launch Team recruitment copy in a PDF that you can grab by CLICKING HERE. For some time we have been promising an alternative to Mailchimp that is designed exclusively for authors. The service is now ready to begin a limited roll-out. The application is still in development, so a little like Book Funnel before, we can offer SPF students a chance to get in before the official release. We have also negotiated an even better deal for SPF students (even better than the standard prices, which are incredibly reasonable). It's called author.email and it will be permafree for SPF students whose list is below 2000 and much cheaper than Mailchimp for those of you with larger lists. Automation works across all price levels, including the free option. To be in the first tranche, please head over to the author.email page and sign up to the waiting list. They are expecting you! Nick and Kevin are the masterminds behind the application and they will be taking on the first 50 SPF students who sign up in this first batch - with more to be onboarded soon. They will manually enrol you in the service, so there might be a delay before you hear back, but the aim is to get everyone in who wants to be in, eventually.